Gates of Vienna: Is the Truth Illegal in Austria? We’ve been following closely the case of Elisabeth Sabaditsch-Wolff, who has a “hate speech” charge pending against her in her native Austria for giving informational seminars about Islam. For those who have written asking about her legal defense fund: it is in the final stages of being prepared, and sometime in the next few days I will be giving you details about how to donate to it. Lawfare in Austria: Is Truth Illegal? Although the trial of Dutch MP and critic of Islam, Geert Wilders, and its serious implications for free speech in Europe, is once again creating a furor in the press, another high-profile trial of a critic of Islam — Elisabeth Sabaditsch-Wolff, in Austria — is being overlooked. As allegedly criminal statements fill the indictments of “hate speech” prosecutions, as in the case with Mr. Wilders, the Dutch MP says that he spoken the truth, and the truth cannot be illegal. If the authorities in the states of the EU have taken note of this axiom, the Viennese state attorney has not. He has taken an even more sinister approach to prosecuting Mrs. Sabaditsch-Wolff: No statements are listed in the indictment. Instead, her entire three-part seminar has been designated as incriminating. I am “always careful to distinguish between Muslims and Islam,” Mrs. Sabaditsch-Wolff says. That, apparently, does not matter. Having spent most of her life in Muslim-majority countries, she has had much time to get to know Muslims as individuals, and to experience contemporary Islamic culture. She has lived in Kuwait; in Iran, as a child, at the time of the Islamic revolution, and, during the 9/11 attacks, in Libya. Her stories are undoubtedly disturbing: two of her non-Muslim friends were attacked for breaking the Ramadan fast — one, a Coptic Christian, was assaulted for licking stamps at a post office; the other, for chewing gum. On another occasion, apparently, when Mrs. Sabaditsch-Wolff sat in her apartment watching the 9/11 unfold on television, and her landlord burst in exclaiming that “the Jews did it,” she asked him to leave. Mrs. Sabaditsch-Wolff currently represents Pax Europa in Austria, and has represented it at the Organization for Security and Co-operation in Europe. 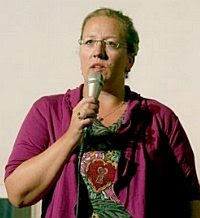 She describes Pax Europa as “the foremost human rights organization in Germany,” although it focuses specifically on the growth of sharia law in Europe, and the erosion in Europe of free speech in relation to Islam. This is the great significance of her case — and those of Geert Wilders, and Gregorius Nekschot, and all the other Europeans who have been prosecuted or threatened with prosecution for speaking the truth about Islam. The “hate speech” laws are already on the books. They take various forms, but they all follow the same guidelines put out by the Muslim Brotherhood and promulgated by the OIC through the UN. Their goal — regardless of the actual intentions of the legislators who passed them and jurists who execute them — is to silence any honest critical discussion of Islam whilst a stealth jihad is waged successfully throughout the entire Western world. We are fortunate to have these heroes amongst us, because we need them now. By the time the success of the Muslim Brotherhood’s “grand jihad” becomes obvious to the populace at large, it will be too late — “the most beautiful sound in the world”, the call of the muezzin, will be echoing over the rooftops of what were formerly the great Christian cities of Europe. The next few years will form the pivot around which the boom of history will swing. If Geert Wilders and Elisabeth Sabaditsch-Wolff don’t stand up for us now, we won’t be able to stand up for ourselves later. Read the rest of A. Millar’s essay at Hudson New York. OT, but I thought that GoV readers and Baron and Dympha might be interested in this PBS episode of Wallander, via the Masterpiece series. Wallander is a Swedish police detective. This episode is about the investigation of Farm Murders (reminds me of Southern Rhodesia and South Africa), and it explores racists and immigrants, in perfect Politically Correct fashion. British actors, English primary language. British production...with American funding, I believe. Original air date Oct. 3rd, 2010. In Britain 'the truth is no defence' - I'm not sure whether that makes it illegal or not, my guess is that it makes the truth illegal in certain circumstances. It's not just Austria where the truth is punishable by law if it errs against political correctness. Every western country has been infected and has plenty of examples. In Canada and many European states there are kangaroo courts with human rights in their title that trample real human rights in the name of invented human rights like the right never to be offended. In this they model themselves on the farcical United Nations body that includes the worst sinners against human rights on the planet judging the countries with the best record. Despite the first amendment, the United States is not immune as the witch hunting on university campuses shows. Even if they are not strictly speaking found to have committed a crime, many westerners are being hounded one way or another ruining their reputations, careers and/or savings for speaking the truth about off limits subjects.